Comedian, actor, and man about town Mike Myers was born in Scarborough, a section of Toronto, to English parents. His mother had been a classically-trained actress, and read stories to her three sons, performing as if she were on stage. Their father loved to laugh, and introduced the boys to British comedy, like Peter Sellers and Monty Python. Early on, Myers wanted to act. He began working in commercials at age eight, and at nine he made a commercial for British Columbia Hydro Electric with Gilda Radner playing his mother. A few years later, in eighth grade, given the assignment to write an essay on "a famous Canadian I'm proud of", Myers chose Saturday Night Live's producer and creator, Lorne Michaels. In high school, to make girls laugh, Myers would slip into the character that came to be known as Wayne Campbell. On the day he finished his high school final exams, Myers was accepted at Second City, the Toronto comedy club that has been a training ground for some of North America's best comic talent, including Radner and Dan Aykroyd. Myers left Second City to tour England with comedian Neil Mullarkey, as Mullarkey & Myers, but he soon returned to Second City in Toronto, where Martin Short spotted him, and recommended him to Michaels for Saturday Night Live. 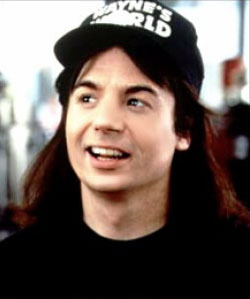 On SNL, Myers became famous as the host of "Wayne's World", with Dana Carvey as his sidekick Garth, and also played the German artiste "touch my monkey" Dieter, and the Barbra Streisand-obsessed Linda Richman (named for his mother-in-law). In 1992 Myers starred in a feature film of the Wayne's World sketch. It earned $121 million in the US, and a whole new generation of teenage boys began head-banging to Queen's "Bohemian Rhapsody." For the sequel, Myers reportedly wrote a script which included Carvey for only a brief cameo. At the studio's insistence, the script was rewritten and Carvey's character was retained for the length of the film, but Wayne's World 2 was a dismal disappointment at the box office. In one of the more unpleasant episodes in his professional life to date, Myers pulled out of Sprockets, a movie based on the Dieter character, saying he thought the script was bad. He was sued for $3.8 million by Universal and for a jaw-dropping $30 million by Imagine Entertainment. Myers said he was right to walk away rather than "cheating moviegoers with an unacceptable script". He countersued for defamation and invasion of privacy, claiming that he and his wife had been stalked by the writ-server and that the production had been unworkable. Steven Spielberg and Jeffrey Katzenberg reportedly stepped in to mediate. The settlement was undisclosed, but reliable sources said it included an agreement that Myers would play The Cat in The Hat. After his father's death, and inspired by the Pink Panther movies, Myers created Austin Powers: International Man of Mystery, which has become Myers' most popular character, appearing in three well-received movies. Since Sprockets, though, Myers has had a reputation for being demanding and difficult to work with. Myers has vehemently denied rumors that Austin Powers' arch-nemesis Dr. Evil is based on Saturday Night Live's Michaels. "Everybody does an impression of Lorne Michaels", Myers has said. "Dana had one, as did Phil Hartman and pretty much everybody including the receptionist". When friend and fellow-SNL alumni Chris Farley died, Myers was tapped to take Farley's role in ogre Shrek, a voice he has reprised in several sequels.